I want to share something with you guys that I have recently developed a small infatuation over. I am only slightly obsessed, so of course I have a whole range of ways you can use these in your home. 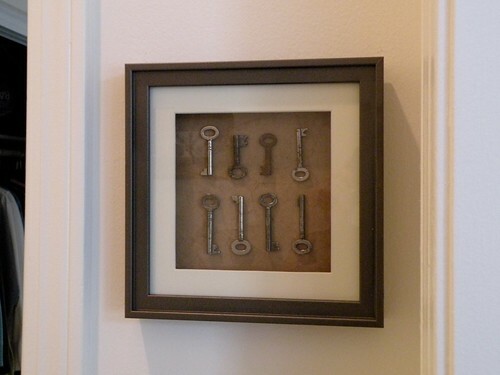 Skeleton keys look great hung in collections on the wall. You can group them in lines. Or mix them into other collections. I love this collection with the pictures of framed doors that Julie @ Less Than Perfect Life of Bliss did in her entryway. They are beautiful vintage accents that you can use in several different ways across your table. 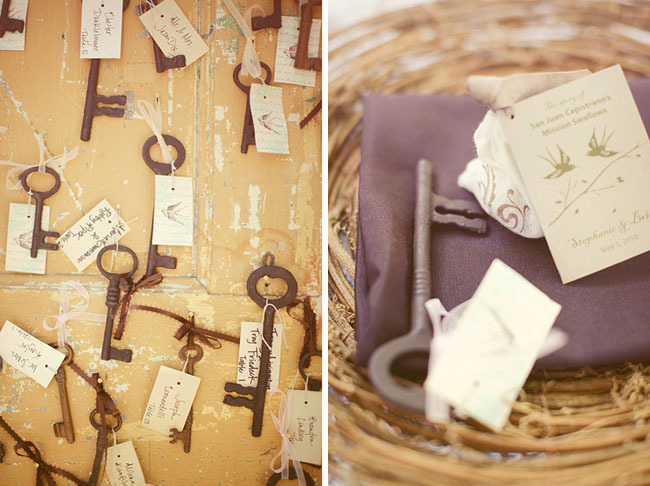 I love these centerpieces tied with a ribbon and accented with skeleton keys. These were done for a wedding but I could totally see these done on any tablescape! Or these beautiful place cards, also from a wedding but they could totally be repurposed for a vintage tablescape. I could also see a key tied around a napkin. I love this shadowbox collection that Allison @ House of Hepworth's made. My favorite part besides the keys? She used torn pieces of brown paper bags and Mod Podged them to create the "background". Or this one from Kate @ The Centsational Girl who made a stand out Restoration Hardware knock off! Love the textured wall paper that she used on the back of hers. I love these vintage wind chimes that Justin @ The Artists' Sandbox made. That would be such a perfectly beautiful addition to any porch and think how creepy you could make it for Halloween! Now, I know what you are thinking now after all these great ideas! Where can I get some beautiful vintage skeleton keys?? Well, I hear that they are easy to come upon at flea markets and antique stores. But if thrifting isn't your thing, you can also pick up this set from HomArt in my Open Sky shop. This is one of the most popular items in my shop! Certainly it is one of mine! So now it is your turn. 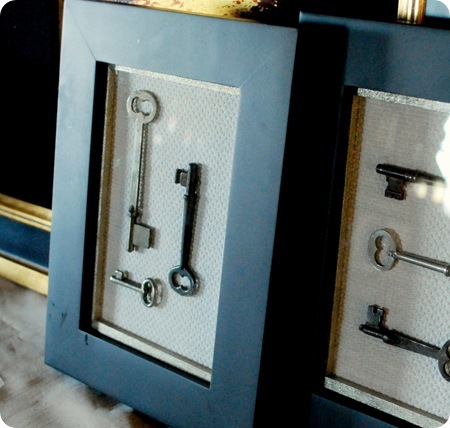 What would you do with a set of Skeleton Keys? Are you as obsessed as I am? Yes, I love skeleton keys! Framing them is a cool idea! Reading this post and all of the wonderful ways to use them, makes me wish I had the keys from my Grandmother's house. As kids my sisters and I always played with them. I am ordering some from your site right now!! I think I will hang them from a mirror with some ribbon in my family room :). J'adore skeleton keys ! So vintage, so charming! Great post Jess! I love these ideas. I have a collection of Italian door and iron gate pictures that we took when we had a vacation there. I will use your idea to hang the pictures with the keys. I was always wondering how to display my door collection. Thanks for posting. I used to lock and unlock interior doors with them in my parents' old house. It was handy to be able to lock my bedroom and my office!